Venetians taught the rest of Europe the art of working with sugar, which is the basis of this recipe for almond brittle. 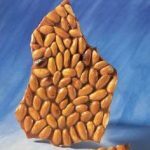 To make the brittle, sugar is boiled until it caramelizes, then poured over nuts on a cold surface where it then hardens to a jewel-like amber with an intense caramel flavor. The croccante can be broken into bits and eaten like candy. Crushed or pulverized it becomes praline to sprinkle on ice cream or use to decorate cakes. The trick of spreading the hot caramel with the cut side of the potato comes from Marcella Hazan, the cookbook author and cooking teacher who lives in Venice. Spread the almonds on a baking sheet and toast them 6 to 8 minutes, until they turn light brown. Spread a sheet of foil on a work surface and oil it lightly. 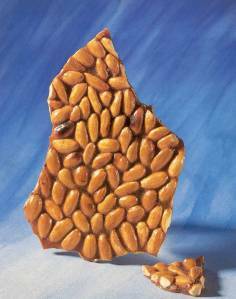 Spread the toasted almonds close together in a single layer on the foil. Mix the sugar and water in a skillet, preferably nonstick. Bring to a simmer and cook over medium-high heat tilting the pan but not stirring it, until the sugar turns pale gold. Continue cooking it, watching it closely, until it turns a rich honey color. By this time most of the bubbling should have died down. Immediately pour the sugar over the almonds and use the flat side of the potato to spread the caramel evenly over the nuts. Until they have a thin, uniform coating of caramel. When the caramel has cooled and hardened, break it into chunks and store it in an airtight container.